We have made an improvement in the Chutescoop, which we call our “Soft Suspension System”. We have replaced the stiff wire pendant (inside the sleeve) with a space age rope “Spectron 12” which is as strong as wire, but soft and flexible. The Chutescoop is constructed using white ripstop nylon (1.9 oz) in various diameters and various lengths to fit boats between 20 and approximately 45 feel LOA. The sleeves are made in nine standard sizes, but custom sleeves of larger or smaller sizes can be ordered. Every Chutescoop has a strong stainless steel ring sewn in a pocket at the bottom of the sleeve. A smooth dacron cloth facing covers the ring to provide a slippery surface to slide over the sail. The top of the sleeve tapers to enclose a specially designed pendant and swivel. Two small lines are attached to opposite sides of the bottom ring and passed through one large pocket on the outside of the sleeve to a block at the top of the sleeve. The two lines ensure a straight (no cocking) lift of the bottom of the sleeve. After passing through the block shive, the two lines exit the sleeve and are attached to a heavier line called a Control Halyard (downhaul line), which is used to pull the sleeve up or down to open or furl the sail. The Control Halyard is also attached to a bridle on the bottom ring, thus forming an endless loop. The lines that operate the sleeve can never come in contact with the sail, since they are on the outside of the sleeve. All materials used in the construction are first quality and strong enough to allow for “reefing” of a spinnaker, if desired. 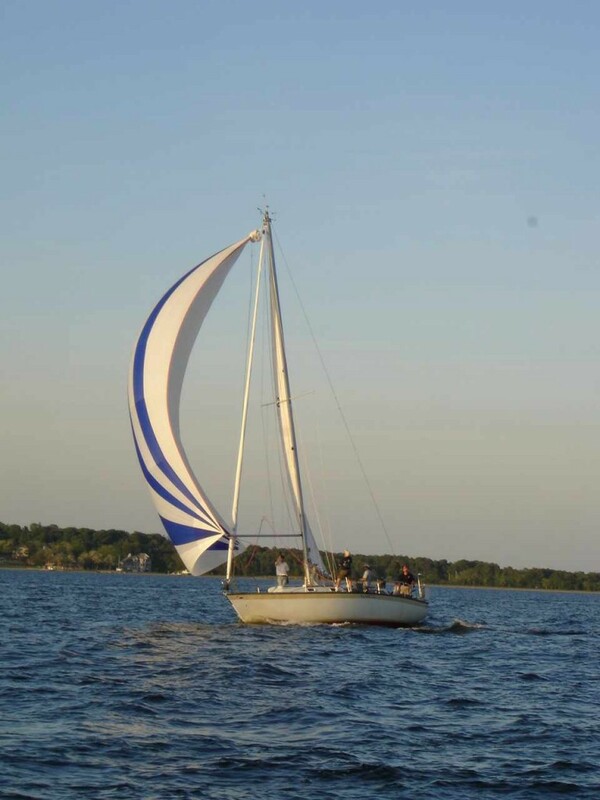 Sleeves may be easily adjusted shorter by the user by shortening the two small lines to achieve optimal fit of the sleeve to the sail, if desired. The white cloth contains no dye so a wet sleeve cannot stain your sail. All sleeves contain a small strip of colored nylon sewn into the seam so you can tell if the sleeve is twisted.